Mrs. Assetou Sy, a native of Mali and American citizen has long been involved in the politics of empowering women. Her mother was a key member of the the Malian former President’s cabinet. She was responsible for travelling with the President and giving the angle of women. It therefore is no surprise that today, following her mother’s footsteps, Assetou founded America’s first-ever Malian Cultural Center which seats members both in the USA and Mali. Mrs. Sy arrived in the USA more than 30 years ago when both she and her husband were studying in Georgetown. From there, Mrs.Sy ventured in to the professional world of the franchise industry, peeking as one of the top managerial staff for the Reise company in New York city. Eventually, she and her husband opened up several private businesses and with their children growing up, decided to bring the most important aspects of their lives together, the Malian culture in America. 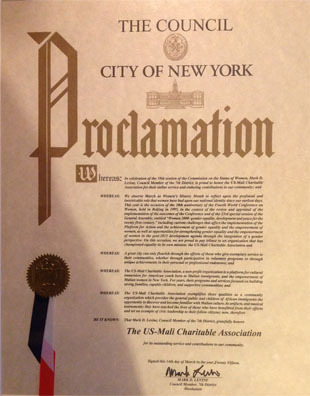 Today Mrs.Sy is the Executive Founder and Director of the Malian Cultural Center of New York, which holds a United Nations- NGO status, 501c3 org and has been recognized by the CIty of New York as a remarkable and dynamic organization bringing culture and education to the children of African heritage. She continues to be the voice of many voiceless women and children who suffer from cultural, religious and even physical abuse. As of today Mrs. Sy holds the following President of the cultural commission of the high counsel of Malian Association of the USA, one of the founding members of the Malian Women’s association, AMADA and Honorable president of the Malian Journalist Association. As of today, Mrs. Sy holds the following title as President of the Cultural Commission of the High Counsel of Malian Association of the USA, She is also one of the founding members of the Malian Women’s association, AMADA and an Honorable President of the Malian Journalist Association of New York. Mrs Sy has achieved the “Council City Of New York Proclamation Award” for three consecutive years. Mrs Sy frequently travels the world to bring awareness to the dangers of FGM. Ms. Sy lives in New York with her husband and 2 adult daughters. 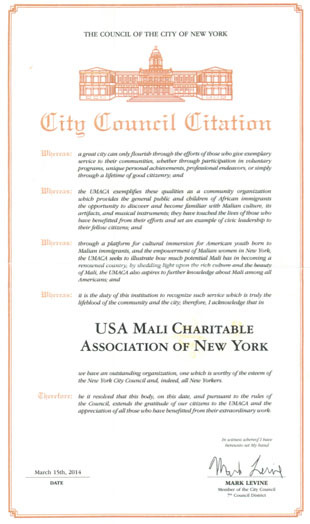 UMACA( US-Mali Charitable Association) is a 501-C3 non profit organization devoted to women and children causes.We provide Malian families going through times with clothing, groceries, medical supplies, toys, etc. Bringing Health Care and Education Closer to Home. Most Malian women and children have to go to distant places for basic health care and education. Mali was named one of the worst countries to be a mother in 2012.Birth rates in Mali remain near 6, among the highest in the world.Infant and children mortality are rampant because of malnourishment and lack of proper health care. 2/3 of the country now being occupied by armed Islamist groups made a bad situation even worse. Thousands of people have been driven out of their homes and live in refuge camps.Today in Northern Mali, thousands of women and young girls are subjected to physical and emotional abuse. Violence and intimidation are preventing women to be active contributors to the society. Their freedom and dignity have been taken away from them. It is our hope to help alleviate their suffering by collecting, buying and shipping medical supplies to those families in need. We also help local communities across Mali build health facilities and schools. In addition to humanitarian work, UMACA has created a cultural center. The Malian Cultural Center Mme ATT Lobbo Traoré provides the general public and children of African immigrants the opportunity to discover and become familiar with Malian culture, its artifacts and musical instruments. We organize sessions of history classes on Malian empires and kingdoms. Your tax-deductible contributions will improve the lives of countless women and children in rural Mali. Please, donate for worthy causes as health care and education in needy villages of Mali.